World War II was a recent, poignant memory for the people who gathered at the corner of the Box Elder County Courthouse grounds on November 11,1947, for the Armistice Day dedication of a bronze statue and plaque bearing the names of Box Elder County citizens who lost their lives in that war as well as World War I. Their parents and families were among the crowd shivering in a chill wind during the outdoor ceremonies. To some of those, this monument was as precious as a grave since their loved ones' remains had not been returned home. It was a touching program, opened with the playing of the National Anthem by the Box Elder High School Band. Mrs. Alben Borgstrom, the mother of four sons who lost their lives in World War II unveiled the monument. A dedicatory prayer was given, a squad from the local battery of the National Guard fired a salute to the heroic dead, and "Taps" was played by Frank Troxel. The color guard and colors of nine veterans' organization posts in Box Elder County formed lines on either side of the Statue during the ceremony. They had marched from the tabernacle, where Armistice Day services were held as a prelude to the dedication. According to the Box Elder News Journal of Nov. 12, 1947, the names of all county residents, who served in the two wars, were to be inscribed and located in a vault in the base of the statue. Who is this G.I. and how did he find his way to Brigham City? Sculptor Aristide Cianfarani, quoted in a 1946 article in the Providence RI, Evening Bulletin, said he used no specific model. "This is the U.S. soldier who went off to war as a civilian and was smart enough to get by on his own, whatever they asked of him." "Towering nearly nine feet above the foundry floor, he looked as though he might have fought his way over a Normandy beachhead, through a South Pacific jungle or out of the Bastogne Bulge" was the bulletin's description of "The Victor" just prior to the statue's departure for Ogden. It's destination was advertised as that city, a mistake some say was based on where the 1,280-pound statue was to be shipped for transfer to Brigham City. "The memorial has been ordered and will be installed as soon as the remainder of the fund can be raised", as Veterans' organizations held a joint meeting in March to help complete the fund drive. Public acceptance had been "swell" according to a later report, with nearly everyone approached donating . Sgt. Harvey W. Wardrop of the Army recruiting service related a touching story: We called at the home of Mrs. Sara Simonsen, widow, 123 E. 6th S., and she responded with a $5.00 donation and said, "I haven't forgotten the boys who gave their life for my country. You see, my boy,Vernon was killed in Okinawa on April 27, 1945. He's buried there, but I'd like to see a shrine erected here for him, and all the other boys who made the supreme sacrifice." All the money hadn't been raised by November. A newspaper article noted "a small amount yet to be paid and any person desiring to contribute were invited to send contributions to the committee, in care of Fred Bradford of Corinne, chairman." The monument was to be erected on Saturday and remain veiled until the day of dedication. Everyone was encouraged to attend. Box Elder County Commission Chairman, Lewis S. Wright said, "We feel that it is very fitting that the entire population of Box Elder County attend this memorial service, and all should remember, for the one day atleast, the sacrifice of our heroic dead to preserve freedom and the American way of life." In the days and years that followed, families often paused before the statue. Sometimes a bouquet or a single flower adorned the marble base, laid there in memory of a fallen GI...perhaps by someone like Mrs. Sara Simonsen who had no local grave to decorate. In an article written by Sarah Yates, former Managing Editor of the Box Elder News Journal in 1995, it stated "The monument has been standing tall and erect for many years, but is showing signs of 'wear'. A while back, the County Commission installed a light at the base of the monument so that the statue could be lighted at night, a great start to what is needed. A few of "us" veterans visited the monument and agreed that a complete rennovation is needed, to include a plaque to honor those veterans who gave their lives in the other wars, Korea, Vietnam, Etc. (2007)Recently, the County Commission agenda listed the monument for discussion, so I (Allen Jensen) attended to find out what they had in mind and offer a few suggestions. The results were, the county has no money but was willing to let the Veterans' Organizations take on the renovation. I explained that the Veterans' organizations also do not have any money. That's where the public comes into play, if the monument could be erected from public donations; the renovation could also be accomplished through public donations. The veteran's organizations e.g. 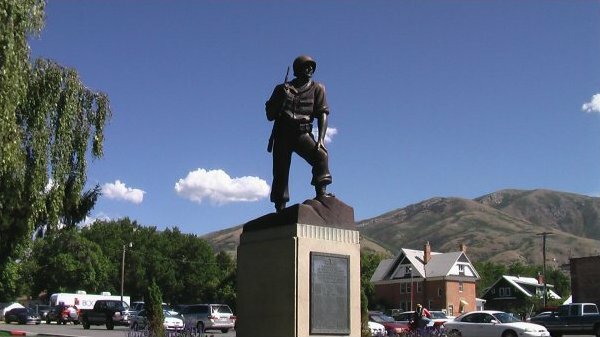 American Legion, Brigham City Post 10, and Auxiliary, Tremonton Post 76, the Veterans of Foreign Wars and Auxiliary, and the Disabled American Veterans are willing to take on the project of renovating "GI Joe". In pursing the cost of the project, it was recommended that a marble base and foundation be used in place of the now deteriorating concrete. This would be more costly but would last much longer. It's like building a highway, build two lanes now and in a couple of years come back and add more lanes to it. Hopefully, this would be the last time "GI Joe" would need renovation. If the renovation is to succeed, we need everyone's help, unlike in the past when funds were needed to erect the monument, each community was assessed for the project. We hope the public will come forth voluntarily to fund this restoration. If the project is to succeed, we need everyone's help. Due to the efforts of many Veteran's Organizations such as The American Legion, The Disabled American Veterans, and The Veterans of Foreign Wars, the much needed renovations will be made to GI Joe. Monies were raised through various ways such as having a booth at the Box Elder County Fair and Brigham City Peach Days, donations from many businesses and corporations, donations from Elementary schools, and general Public donations. Many volunteer hours and efforts were given by many Veterans to help raise the funds necessary to renovate the statue. Currently (2007), a new plan for GI Joe is in progress. Some modifications to the landscaping of the County Courthouse are to include seating, lighting, flowers, and shrubbery. Rebuilding a firm foundation for the structure of the statue and re-furbishing the statue itself will help to preserve the statue for many generations to come. A re-dedication ceremony will be held on Veterans Day celebration 2007. When the face of the monument was removed for renovation, it was interesting to see how the first original base was created. Large stones, rebar, wooden spikes, and wire. A time capsule was also discovered.